Samsung have caught the spotlight at IFA this year for their tablet computer the Galaxy Tab which, if Ashley is to be believed, is setting the agenda for the next iPad. 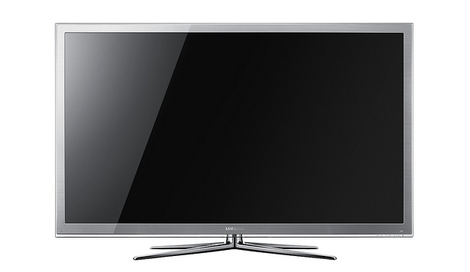 But they have another show-stopper product this year and it’s in an equally hot area – 3D TV. It’s huge. With a 65 inch screen, it is officially the world’s largest LED television. The C8000 3D TV comes with Wi-Fi connectivity and web-connected TV apps – a nice touch. They’ve put a bit of effort into the screen too, as you’d expect. It has precision dimming technology for deeper black levels, and a little something they call 800 CMR motion clarity processing, which is probably to do with making the picture clearer. According to Samsung, it “provides superior picture quality with Samsung’s proprietary 3D processor”. The price is on the hefty side too – take a breath – 5995 Euros. Shiny Poll: that new iTunes icon – what do you think? Unbelieveable Screen, this is a love on first sight!! I have fallen in love with it at first sight. I am gonna buy it.